As the strongest hurricane ever recorded in the Atlantic plows toward the US, FEMA is broke and US policy on disaster relief will make things much worse. Miami, FL – The National Hurricane Center (NHC) Atlantic Ops, which provides analyses, forecasts, and warnings of tropical cyclones and disturbances over the Atlantic basin, is reporting that Hurricane Irma is now the most powerful hurricane in the Atlantic basin outside of the Gulf of Mexico and Caribbean Sea in recorded NHC history. “Preparations should be rushed to completion in the hurricane warning area,” the NHC cautioned. “Hurricane Irma is now expected to *exceed* the theoretical maximum intensity for a storm in its environment. Redefining the rules,” according to meteorologist Eric Holthaus. The Governor of Puerto Rico, Ricardo Rossello, urged the U.S. territories 3.4 million residents to seek shelter prior to the monster storm hitting the island – which is expected as early as Tuesday night. “This is something without precedent,” Rossello told a news conference, noting that he will ask U.S. President Donald Trump to declare a federal state of emergency even prior to the mega-storm making landfall in an effort allow for the immediate disbursement of U.S. emergency funds. Ironically, with Houston, Texas still underwater from Hurricane Harvey – and Irma predicted to directly hit Florida – the Federal Emergency Management Agency (FEMA) is expected to run out of money by Friday, according to a Senate aide, putting pressure on Congress to provide more funding this week, according to Bloomberg. As of 10 a.m. Tuesday morning, FEMA’s Disaster Relief Fund, which pays for the agency’s disaster response and recovery activity, had just $1.01 billion on hand. And of that, just $541 million was “immediately available” for response and recovery efforts related to Hurricane Harvey, according to a spokeswoman for FEMA who asked not to be identified by name. The $1.01 billion in the fund Tuesday morning is less than half of the $2.14 billion that was there at 9 a.m. last Thursday morning — a spend rate of $9.3 million every hour, or about $155,000 a minute. The agency would be out of funds just as Irma, a category 5 hurricane, might start thrashing the coast of Florida. The Trump administration has already requested almost $8 billion in additional funding from Congress. As of now, FEMA has restricted spending to “immediate needs” — what it defines as “lifesaving, life-sustaining response efforts” — for Harvey and Irma. Zimmerman said the agency must begin pulling money from other projects, but without an injection of funds, FEMA will likely not have the resources to deal with current and upcoming disasters. “We’re not even at peak hurricane season,” Zimmerman noted. Irma comes in the wake of Hurricane Harvey, which caused widespread damage on Aug. 25, including flooding and power outages, while taking out nearly a fifth of all U.S. oil refining capacity. Bloomberg reports that Irma’s current path – a direct impact with Florida – has prompted the state to prepare for the “catastrophic” system. Florida Gov. Rick Scott, while appearing on “Good Morning America” today, cautioned people to be prepared but to only take necessities as they flee from the hurricane. A number of areas in Florida have seen gas shortages as the #nogas hashtag began appearing on social media sites on Tuesday. Gas stations in Tampa have run out of gas, and long lines have formed in both the Orlando and Miami areas, according to ABC News. Meanwhile, Tropical Storm Jose is following behind Irma on a similar path. Jose officially became a tropical storm on Tuesday before noon with winds of 40 mph and is expected to become a Category 2 hurricane by the end of the week. It could skirt the most northeastern Caribbean islands, but so far it is not projected to be a threat to Puerto Rico or the U.S. While Floridians made preparations for Hurricane Irma, as of Wednesday morning, the Category 5 storm’s eye was clocking sustained winds of 185 mph and gusts over 200 mph. Weather models predict the mega-storm will move north of Puerto Rico and the U.S. Virgin Islands by this afternoon, unleashing strong winds and heavy rain but not directly hitting the islands — with Irma predicted to make a “direct impact” on mainland Florida and travel straight up the middle of the state, according to the NHC. 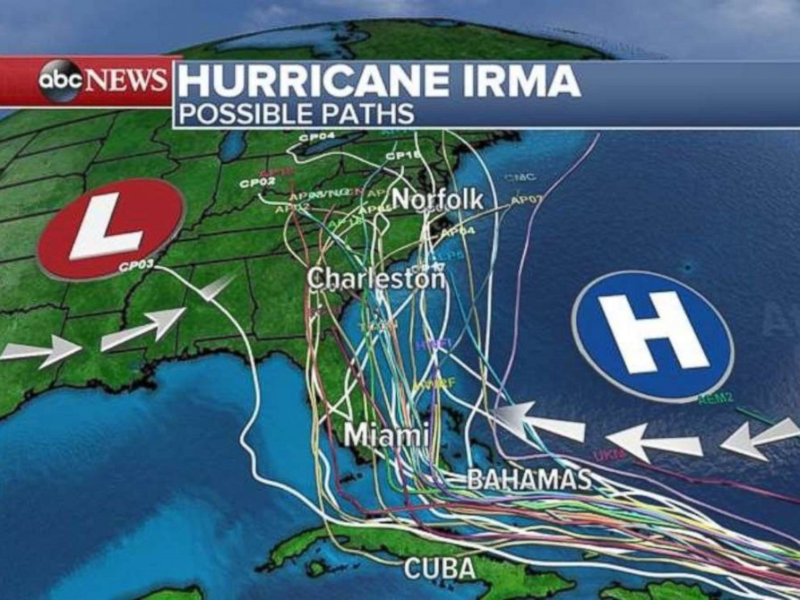 The latest computer models, which project possible routes for the hurricane, show Irma could potentially move further to the east and threaten the Carolinas and the East Coast of the United States. While too early to determine the exact path of Irma in Florida, damage modeling for a direct hit on Miami reaches into the $200 billion range, according to Watson. For reference, the devastation wrought by Hurricane Katrina topped out at $160 billion. Only three Category 5 hurricanes have hit the contiguous 48 U.S. states, Bob Henson, a meteorologist with Weather Underground in Boulder, Colorado told Bloomberg. The Labor Day Hurricane of 1935 that devastated the Florida Keys, Hurricane Camille in 1969 and Hurricane Andrew that cut across Florida in 1992. Andrew was originally classified as a Category 4 storm only to be upgraded years later after further analysis. As Ron Paul noted during Hurricane Harvey, the United States is only one fiscal hurricane away from economic devastation. Federal flood insurance was almost $25 billion in the red before Hurricane Harvey. Congress will no doubt appropriate funding to pay all flood insurance claims, thus increasing the national debt. This in turn will cause the Federal Reserve to print more money to monetize that debt, thus hastening the arrival of the fiscal hurricane that will devastate the US economy. As for who will come to the aid of the Americans hit hardest by the storm, Paul states the obvious.